Front page of a national magazine tells us more of our soldiers have committed suicide than have been killed in action. This is beyond shocking to me. How can we as citizens give this country’s government-industrial-military regime any response but “SHAME ON YOU” . Soldiers have been sacrificing themselves willingly and by conscription for so many wars that we have become complacent, numb and dumb. We all in some manner accept pacifiers of many dimensions to keep from seeing and knowing how shamefully treated these warriors and their families are. This article in the most recent Time periodical is shocking. Can we not see that? Have we lost all outrage? Connect the dots. 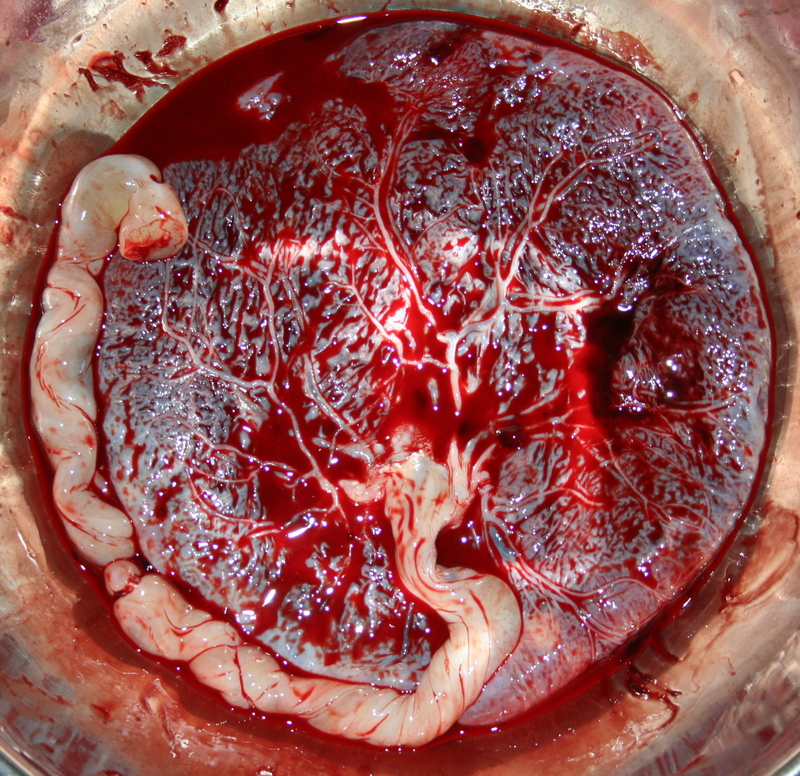 I posted this photo of the birthing placenta along with this rant because all humans and many, many other mammalian species have this basic source of life in common. Same source, can’t we finally get this connection? How long do we drag this appalling genocide of all beings across this planet and claim socialized murder as our right? Is our species truly that unteachable? All the evidence seems to point in that direction. There are no warm and fuzzy’s along the way that make this revelation any less real. I hear spiritual teachers of all flavors claim that love is the way of the Universe. Now there’s a crock of poo, big time, if I’ve ever heard one. Cruelty, stupidity,carelessness and greed are more common descriptions. The tears have been flowing down my face since this issue of Time literally fell onto my desk. I’ve been indulging in a self imposed sleep cycle for years. The truth of my nations and every nations greedy race to claim power on this planet hurts to imagine and even more, to perceive it’s inevitable processes and consequences. Hear that statement again, “More soldiers dead by suicide in this war than by enemy actions”. Shame, shame and more shame. Endless and uninterrupted shame poured upon those who create and maintain war for profit. How can we who have so many unbelievable gifts as part of our humanity condone any longer this blatant neglect and cruelty by our government of those whose only desire was to serve and protect? It feels like my heart, mind and soul are bleeding out. Rivers of blood pouring across the land, everywhere. All the wounded and those who survive crying and bleeding, generation after generation, all cultures, everywhere on this planet. This past week I worked with a group of people who are amazing teachers, artists, and creative spirits. The event was a week long ”camp” for 5 to 8 year old community kids. Teaching stories about labyrinth, journeying to find treasure within oneself, ritual and rhythm in the world, story telling by a master, all pointing to the opening of the pathway before us. It was spontaneous, creative and joyful. 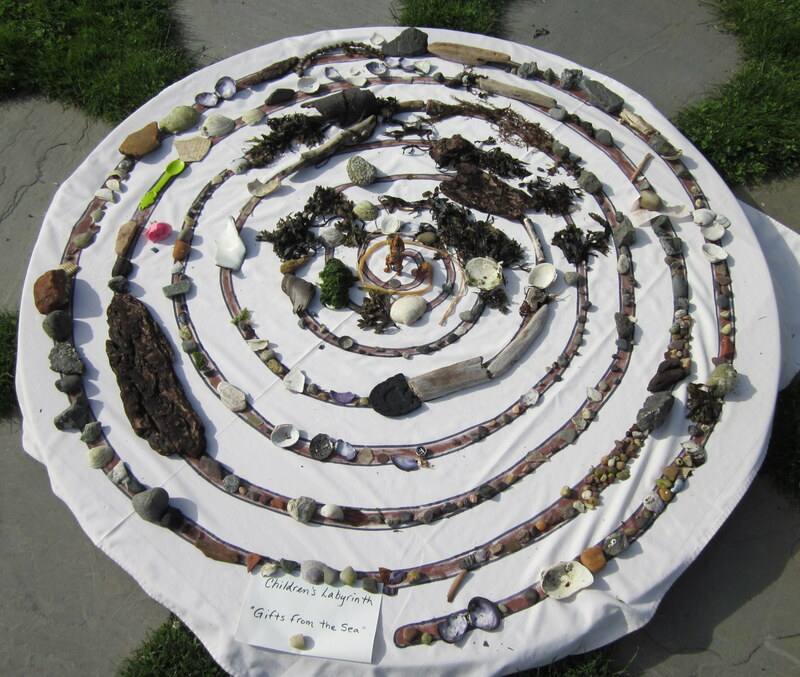 This spiral cloth marked the center of our formal outdoor labyrinth and after a trip to the ocean collecting bits of found treasure these were placed on the path. At the ending ceremony on the final day it was carried back to the sea, returning all to source. 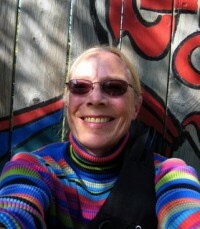 Recognizing the common themes, rhythms and components of all life that we share. Creating sacred space and what that means. Wonderful. 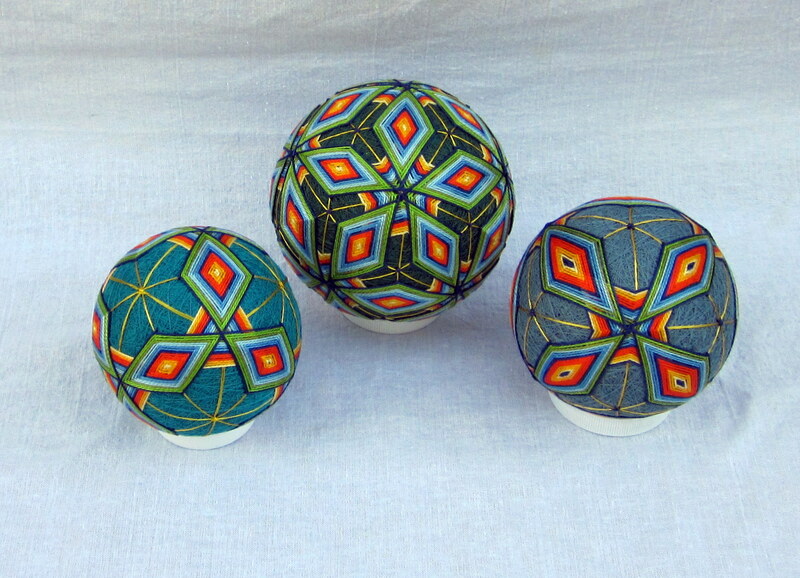 This newest Temari was a challenge. It was the most difficult one so far, much more complicated in grid form and technique than all the others. 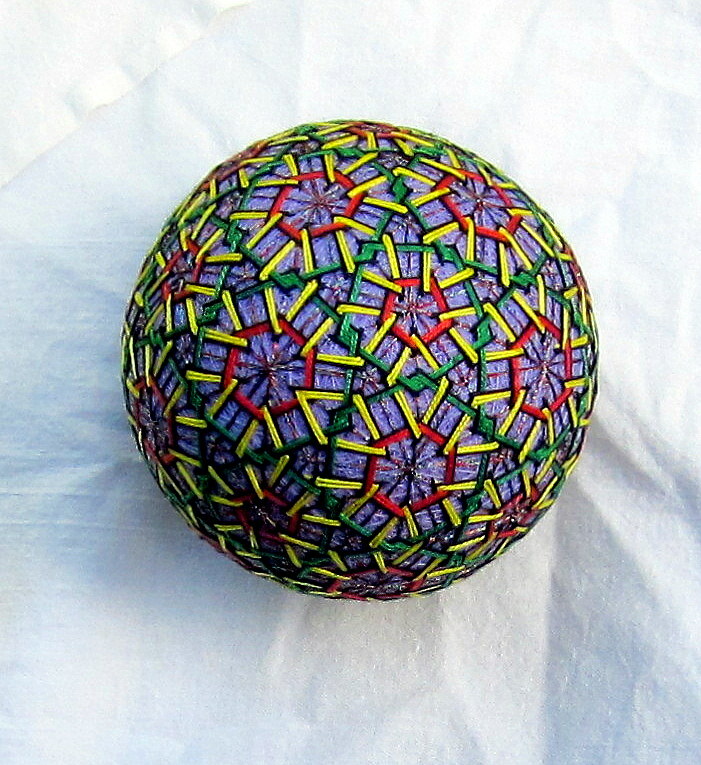 The whole thing from winding the ball to marking the grid and adding the second group of support lines challenged me. The words “can’t do it” over and over, pushing my buttons, stirring the pot. It’s finished, finally. Looks good but I know what it’s flaws are, I know now what would have made it better and easier even. So, yes, I did learn a great deal and will take this new knowledge forward into the next ball. I used Barbara Seuss’s new book Temari Techniques as my guide. I’m self teaching so her words and guides are fabulous. It’s a wonder book for all levels of Temari skill.